Vasaslätten and the Turkish Pavilion to the left, the ring path around the Great Lawn to the right. Stockholm just might be the greenest major city I have ever experienced. In central Stockholm, there are a good number of small, leafy parks, but it is the ring of parks just outside of downtown that makes Stockholm a truly special green city. Several of these parks, all easily accessible by subway, have been combined into the world’s first National City Park. These parks exist today because the land has always been owned by the monarchy and because the monarchy, for various voluntary and involuntary reasons, has only marginally developed them over the centuries. Haga, just outside of Norrtull, or the North Toll Gate, is one such park. Light green = Haga Park, dark green = other green spaces including a large park-like cemetery to the west. 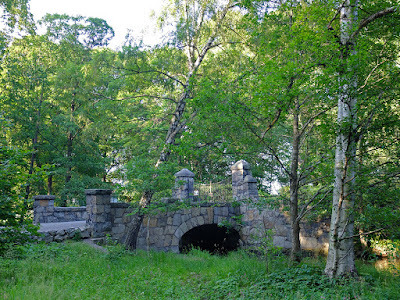 Haga is a park of extremes: beautiful manmade “natural” landscapes, surprising mid-city wilderness, and disappointment in the left-over, somewhat abandoned, and semi-developed areas outside of the main park developed by King Gustav III in the late 1700’s. This blog post will deal with Gustav III’s more developed, well-kept, and beautiful areas of the park; I will write about the more disappointing areas at another time. When King Gustav III bought the land which is now Haga Park, it was truly rural and consisted of several farms—the word haga means “pasture.” Today, however, it is adjacent to downtown Stockholm’s city grid and provides an important counterpoint of green lawns, forests, and meadows to the city’s dense, built-up urban environment. Haga Park was the creation of King Gustav III and it is a manifestation of the shining but troubled Gustavian era. Haga Park, King Gustav III, and Swedish politics are one entangled story. It is impossible to write about Haga without including the King and the political situation because Haga’s creation was a direct reaction to politics and was shaped by the King’s changing ideals and political needs. Gustav III is a study of contrasts. Beloved by the people but hated by the nobility, Gustav was a firm believer in absolute monarchy, but he ended up giving rights and power to the lower classes in an effort to fight the nobility. His concessions to the lower classes ended up costing him his life. A triangular pattern of collusion and conflict became clear: The King wanted absolute power, but he had to be politically savvy in the period of Enlightenment when the People were awakening and demanding rights. Thus, the Monarchy allied itself with the People against the Nobility. The People wanted freedom and representation but knew that the Nobility would never grant it to them since a large, cheap, and powerless working class was the basis of the Nobility’s wealth. Thus, the People allied themselves with the Monarchy in return for a slow drizzle of new rights and freedoms. The Nobility wanted control of all the power and wealth, but realized that there could be no Nobility without a Monarchy. Thus, the Nobility fought to keep the Monarchy in place but to limit its power. Sweden’s entire political history since about 1000 A.D. can be summed up as one long fight for power between the monarchy and the nobility, and in the half century before Gustav III, the monarchy’s power had been sharply eroded in favor of the nobility and mercantile classes. Gustav III aimed to take back power and control, and a year after his crowning in 1771, he staged a successful and bloodless coup which dismantled the two powerful factions of nobles. He wrote a new constitution for Sweden which effectively created an absolute monarchy—the King was now able to appoint his own council as well as the Justices of the Supreme Court (previously appointed by the nobility), the King was his own finance minister, the King was his own department of state, and the parliament (all nobles) was only to meet once every six years. It is important to remember that this coup occurred just a few years before the American and French Revolutions and that the international demand for representative government, freedom, and rights was rising even in Sweden. In an unusual twist of Machiavellian maneuvering and political dexterity, Gustav managed to align himself with the lower classes while smashing the rights of the nobility. Gustav III’s constitution gave in just enough to the demands lower classes: the use of torture was abolished, public healthcare was improved, military honors and promotions were to be based on merit and not social status, several crippling trade monopolies were abolished, and religious freedom was granted. The people loved Gustav III, and Voltaire even praised him and his coup as the savior of a free people. Gustav III’s coup and new constitution naturally strengthened the nobles’ hatred for the monarchy. The next 20 years was a tug-of-war between the two institutions. A series of ruinous harvests unsettled the farmers and the lower classes and created a growing class of beggars, making the political situation even more turbulent. In an effort to regain some of Sweden’s former 17th century glory and to distract the growing discontent among both the nobility and the people, Gustav declared war on and invaded Russia in 1788 with the goal of taking back St. Petersburg. Although Gustav III won several important battles, the war did not result in any border changes. The war was of course expensive, and Gustav III found himself tied by the nobility once again as they made it impossible for the king to build up his treasury as they still had the right to approve the levying of new taxes. The king staged another coup in 1789 and arrested the leaders of the nobility and wrote yet another constitution. This constitution further reduced the nobility’s power and strengthened the absolute monarchy, including the right to declare war and levy taxes without parliament’s approval. It also gave the lower classes the right to name representatives in the King’s council and farmers were given the right to determine what to plant in their own fields. While giving concessions to the people, the King simultaneously allied himself with Russia’s Catherine the Great and France’s Louis XVI in an effort to stem the tide of free-thinking and revolution which threatened Europe’s monarchies. In a desperate attempt to take back the nobility’s power, a faction of nobles planed the assassination of King Gustav III. He was shot at an opera masquerade ball in 1792; the gunshot did not kill him but he died two weeks later from infection to the wound. (Verdi's opera A Masked Ball was based on these events.) Gustav III’s son was conveniently too young to rule, so a group of nobles ruled over the country and “educated” the prince until he was old enough to govern. Sweden’s monarchy has been a powerless constitutional monarchy ever since. There was much more to King Gustav III than an old-fashioned and ill-timed desire for absolute monarchy. He was Sweden’s first well-travelled monarch and he encouraged a cultural flowering which forever changed Sweden’s stagnant and inward-looking society. His first trip to France was cut short when he was called home by news that his father the King had died, but the trip was long enough to make a lasting impression on him. Gustav fell in love with and was heavily influenced by the excessive French court; the shining lore of the Sun King Louis XIV; French music, theater, opera, and dance; the countryside idyll of Versailles; and French literature and language. About a decade after being crowned King, Gustav III left Sweden for a two-year Grand Tour, most of which was spent in Italy under the alias “Count of Haga.” There, he studied ancient Roman architecture and read Vitruvius and Palladio. We know that he also visited several of Palladio’s estates including the Villa Rotunda as well as several art collections and museums including the Vatican Museums. In Italy, the King purchased large quantities of antique sculpture and hired a permanent agent to make purchases after he returned to Sweden. 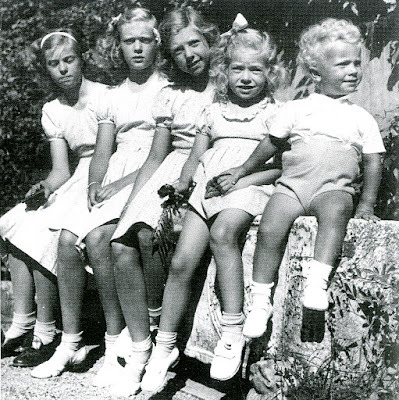 Back at home in Sweden, the king founded a royal ballet, a royal theater, a royal opera, built an opera house, and subsidized Swedish authors, poets, playwrights, painters, sculptures, and composers to create original works in Swedish. He founded the Academy of Music, the Academy of Painting and Sculpture, the Swedish Academy to protect the Swedish language, and the Academy of History and Antiquities. He made plans for a museum of the classical sculptures he had acquired in Italy. The king was a bit of a Renaissance man and composed his own plays and operas as well as sketched architectural ideas for his own building projects. He was well-educated and widely read. Just as his political life was full of strife, Gustav III’s private life was also troubled. He was unhappily married to Princess Sofia of Denmark and his mother Lovisa Ulrika openly worked against him in the political realm. She even spread (quite possibly true) rumors that his son the Crown Prince Gustav IV Adolf was illegitimate. He had no close friends and kept a cool distance to everyone because of the turbulent political climate where it was impossible to truly know who was friend or foe. It is against this backdrop of political intrigue, cultural flowering, and personal discontent that Gustav created Haga Park. He began spending time at Haga in 1767, several years before he became king. He was living at Karlberg Palace that summer and pastoral Haga was within easy daytrip range. Gustav III loved Haga—it was close enough to the city to be convenient and easy to reach, but it was far enough outside of town to be pastoral, idyllic, and out of the heated public eye. He bought the Haga farm in 1771 and used the original farm house, known as Gamla Haga or Old Haga (Map 1), as a country residence for 20 years. During this time, the King and his architects planned an extensive park with exotic pavilions as well as a grand palace. Gamla Haga is now rented out as a private residence. The King used Haga as a private retreat, and only invited guests were allowed to enter the grounds. Even the queen was seldom invited to Haga. In this way, the King was able to temporarily escape the city’s political intrigues. Because the preparations and planning for important events such as his crowning, both political coups, and the war with Russia always took place at Haga, the king was also able to control who was “in the know” and when certain information was made public. No official record was kept of events and activities at Haga, and few guests risked a future invitation by talking or writing about their experiences at Haga. The only evidence we have of what daily life was like at Haga comes from receipts for purchases and services rendered. Life at Haga was much more informal than at court in Stockholm. In the private realm of Haga, the King could shrug off the duties and expectations which weighed on him in the city. At times the King kept himself politically and socially isolated at Haga, but at other times he threw ornate parties with extensive guest lists. Haga throws another light on Gustav III’s nature of duality as he was obviously enamored of luxury and privilege, yet he genuinely preferred a simpler life in the countryside to an extravagant public life in the city. Plans for the Grand Palace at Haga waxed and waned with Gustav III’s political intrigues. It was first envisioned as a private countryside escape from politics, but as Gustav III’s role of absolute monarch was more and more in question, the palace swelled to become a representative embodiment of the omnipotent monarchy. No building in Sweden could compare in size, grandeur, or sumptuousness. The King drew up a plan for the park immediately after purchasing the Haga Farm. This plan is very formal with axial allés, traditional gardens, and the expansion of the existing farmhouse into a large palace at the water’s edge. 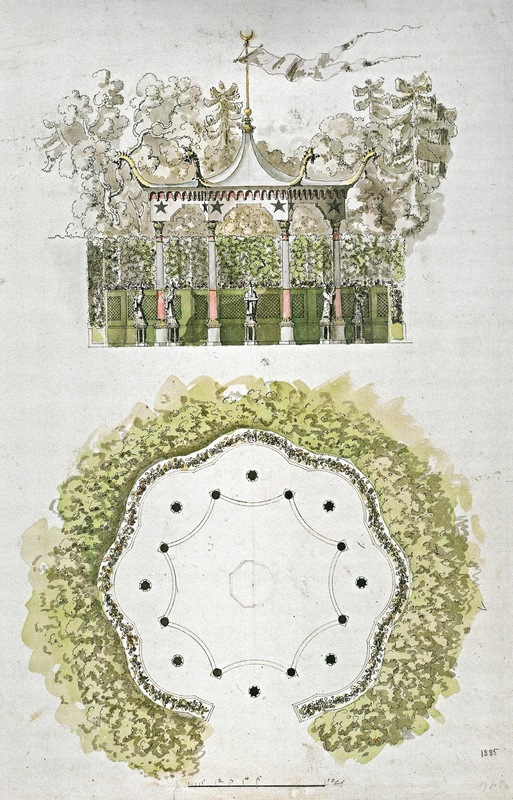 The King’s garden plans were most likely an attempt to imitate the grandeur and formality of Versailles. 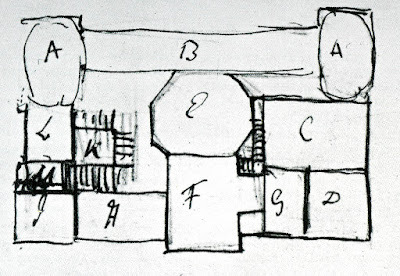 The King even drew plans and an elevation of the expanded farmhouse which was to be given a vague castle-like appearance with two round towers. Work immediately began on waterside paths, paths and bridges to several nearby islands, and a small pavilion. Receipts show that countless fruit trees and shade trees were planted throughout the estate, but these seem to have been somewhat haphazardly planted as there was no real landscape plan until the 1780’s. The King hired Landscape Architect Fredrik Magnus Piper to draw plans for a large park at Haga. Piper was recently home after seven years abroad in France, Italy, and England where he had studied landscape design. 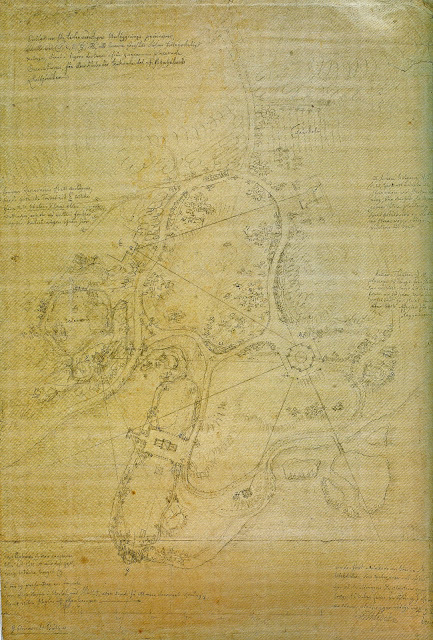 Piper’s proposal for the park was drastically different than the King’s drawing and introduced the romantic English garden to Sweden. Gone were the King’s allés, axes, and formal gardens. Instead, Piper introduced winding pathways, artfully placed follies, seemingly random plantings and groupings of trees, glimpses of distant destinations, artificial hills and valleys, picturesque lawns, and an intimate house by the water. 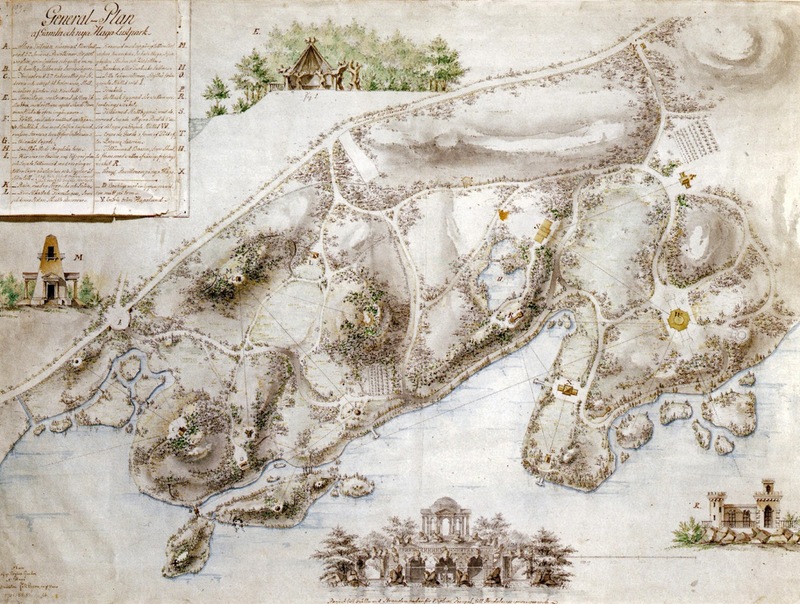 In 1785, the King bought the adjacent Brahelund farm as well as Bellevue, Tivoli, and Frescati on the other side of the bay. Piper adjusted his park plan to incorporate these new estates into one grand design. 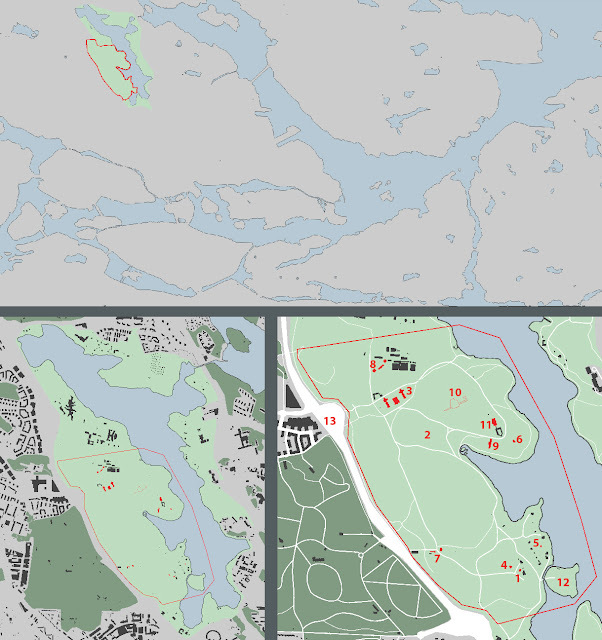 The water of Brunnsviken was the hub, and various parks radiated from the hub-like spokes. Piper intended to create a coherent belt of English parks around the entire bay. 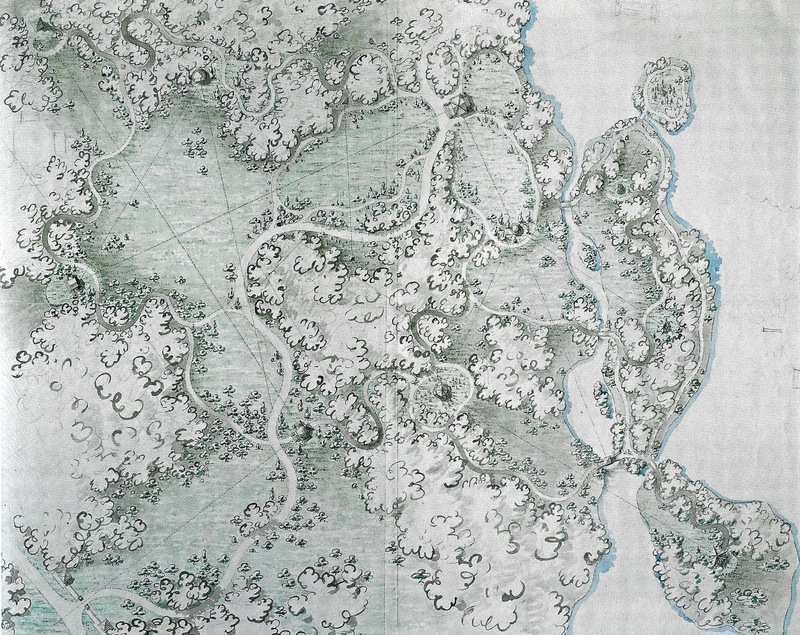 However, the king’s interest in the estates on the other side of the bay cooled off by 1786, and Piper concentrated on the cohesion of Haga and Brahelund into one magnificent park. 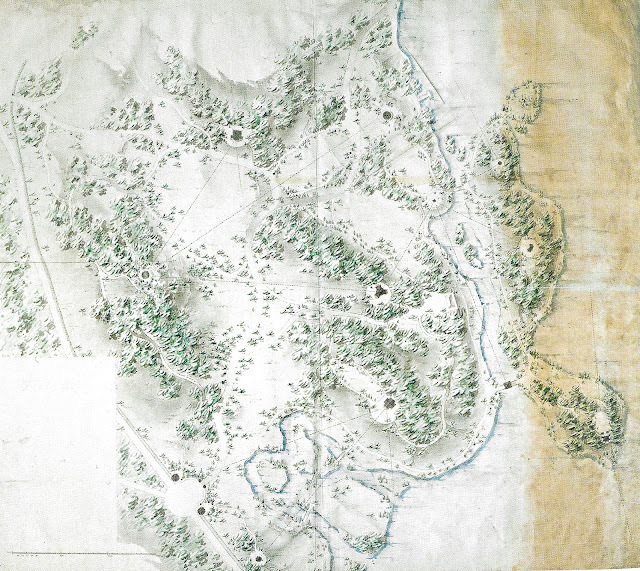 Piper’s altered general plans for the park (1785, 1787) are somewhat more formal in nature. The palace moved from the water’s edge to the top of a hill, creating powerful sightlines across the valley. The farmhouse Old Haga was also dismantled and rebuilt upon another hill. Another significant change in Piper’s plan was the inclusion of a Great Lawn (Map 2). He also compromised with the King’s love for allés and lined several gently curving roads with trees. In 1788, the king replaced Piper with a new architect, Louise Jean Desprez, a Frenchman who was educated in Italy. 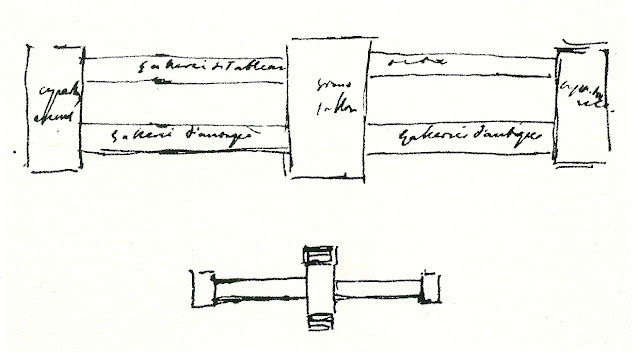 Desprez does not seem to have drawn any plans for the park, but he used watercolor panorama landscapes to illustrate his ideas instead. Emphasis shifted literally from planning the park to experiencing the park. Desprez moved follies closer to the palace—where Piper had placed emphasis on distant views and excitement-building glimpses, Desprez was more pragmatic and placed the follies within easy reach of the King and the palace. Throughout the King’s life, work never ceased on Haga. It was a continual project which the king prioritized over other building projects. Even during the two coups and the war with Russia, work on the park did not cease. Only the King’s death in 1792 could halt the park’s progress. One of the most important aspects of a romantic English park is the folly. Follies create distinct destinations within a park. Short glimpses of them from a curving footpath create excitement and a desire to reach them. 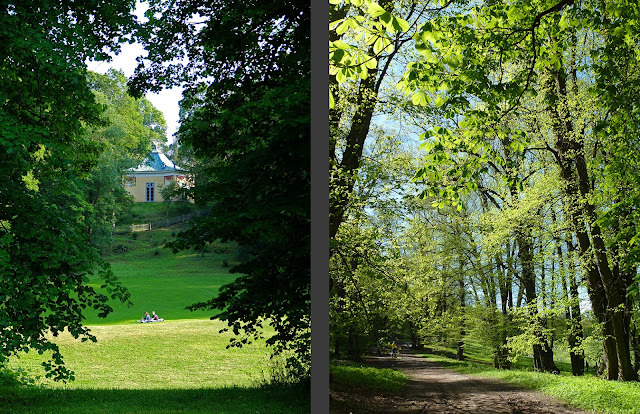 Views between follies and from a palace increase the feeling of a park’s expansiveness and grandeur. Follies representing different exotic countries and different time periods further expand the park’s experiential boundary. More practically, they can provide shelter during a sudden downpour or a dry place to sit for a picnic. Piper integrated follies into the park’s design from the very beginning, and they continued to be important throughout Piper’s development of the park plan. Desprez continued to work with follies when he took over as park architect, but his follies were much grander in scale. This is in keeping with the palace which also became much grander over countless design revisions. Although several of the planned follies were never built and others have been demolished over the centuries, there are still several unique follies in the park today. This is quite impressive considering that the follies were generally cheaply built out of wood. Apparently, they were nearly lost but a restoration effort in the 1930’s saved them from ruin. 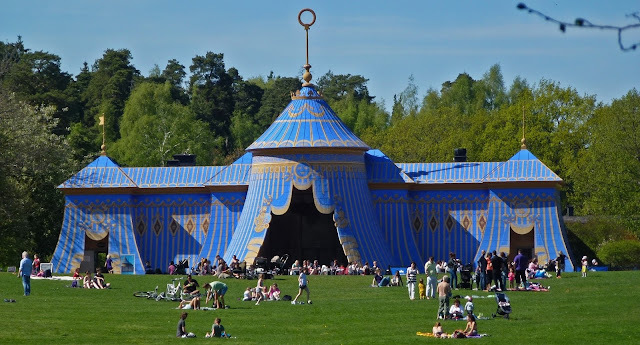 The first (surviving) folly are the Roman war tents, generally known as the Copper Tents because the facade is made of painted copper sheets (Map 3). These "tents" are really just facades on regular buildings. 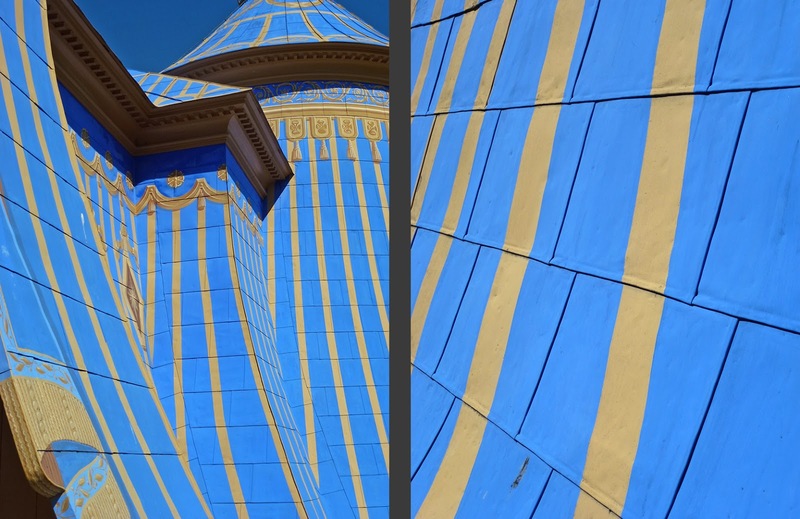 Fittingly, the Copper Tents were designed by Desprez in 1787 to serve as barracks for the King’s guard. A nearby outbuilding, also by Desprez, continued the Roman theme and was meant to resemble the ruin of a Roman amphitheater. This outbuilding was never built. 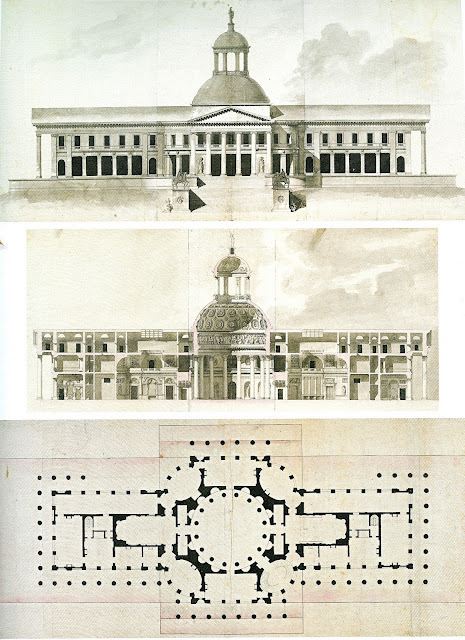 The Turkish Pavilion was originally designed by Piper in 1785 and but it was built in 1788 to a simplified design by Desprez (Map 4). The Turkish Pavilion as drawn by Piper in 1785 (1) and as executed by Desprez. It was connected to the Haga Farmhouse by a covered, heated walkway and was used by the king to host intimate parties, theater performances, and even important meetings. The war on Russia was planned here. 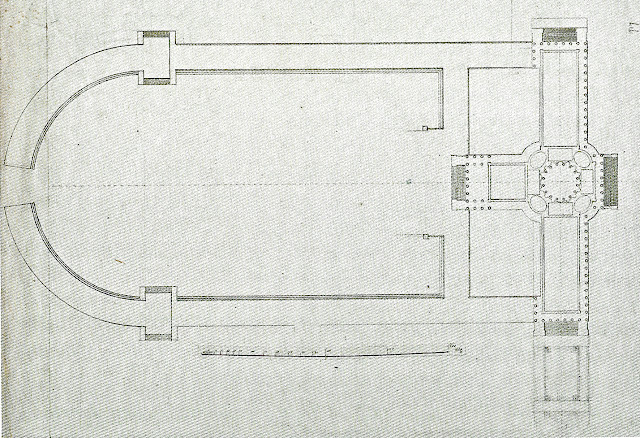 The Turkish Pavilion interior as drawn by Piper in 1785 (1) and as executed by Desprez (1). In a purposeful effort to mislead the Russians, Gustav began a hectic design spree and asked Desprez to design and draw scores of follies for the park. Gustav leaked information about the coming building spurt, and this disinformation was successful in misleading the Russians into believing that Gustav was too busy with his building projects to attack. Many of these follies—Roman temples, Egyptian obelisks, and the like—weren’t meant to be built, but a select few were in fact completed. A Chinese Pavilion was built atop a hill in 1788 (Map 5). It was designed by Carl Christoffer Gjörwell, a student of and assistant to Desprez, in close consultation with the King. The same year, the Amour and Psyche Temple was built specifically to house a sculpture group by Swedish sculptor Sergel. 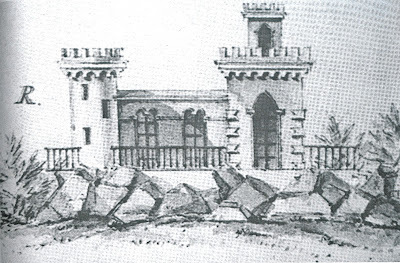 This folly was also designed by Desprez. It is now demolished. 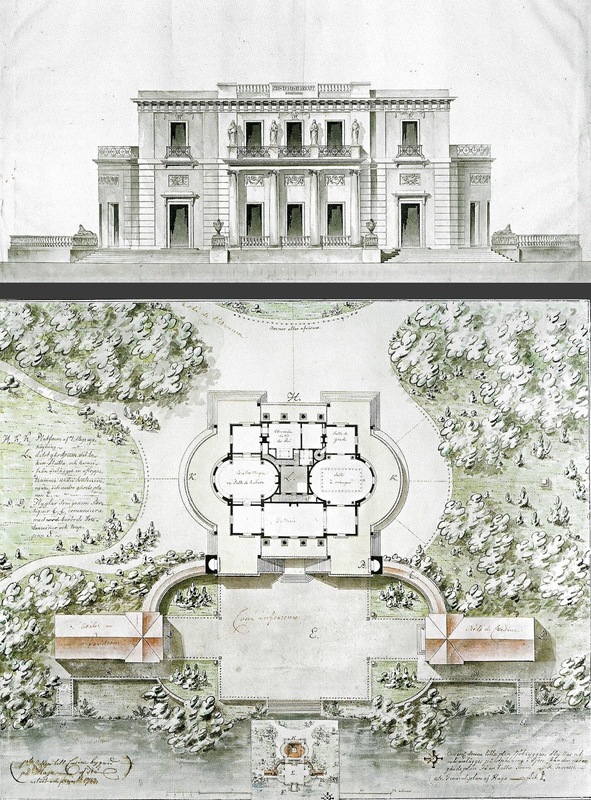 The King also played a direct roll in the design of the Eco Temple which was drawn by Gjörwell and built in 1790. It is on a small hill just above the Gustav Pavilion and was used as a summer dining room (Map 6). At about the same time, a freestanding kitchen building was built near the Gustav Pavilion. The kitchen and quarters for kitchen staff was designed by Desprez and was meant to look like a medieval ruin complete with crenellated tower. This building has not survived but it is depicted in several paintings from the 1800’s. One of the most imaginative follies was a man-made 100-foot-tall waterfall. A tunnel was blasted from the water’s edge up through a granite cliff. At first the plan was to pump water up the cliff with a steam engine housed in a Gothic castle with crenelated towers (designed by Piper), but the plan was later changed and the King bought a scenic windmill to pump the water instead. A secondary use for the water was to supply a planned horse stable, located on the same hill, with water. The tunnel was dug and the stable foundation was laid, but the pump, waterfall, and stable building were never finished after Gustav’s death. While not follies in the traditional sense, Haga has a long tradition of exotic pleasure boats. Gustav had two huge Venetian gondolas built, one of which had a wild swine carved into its neck, the other of which was whale themed. 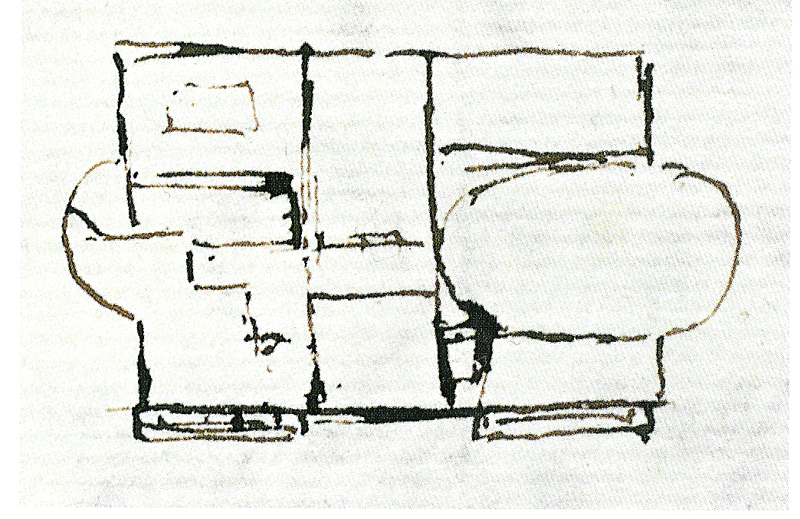 Gustav used the boats to go on “promenades on the water.” Desprez drew up another boat which consisted of a galley boat crowned by a Sicilian temple. This boat was known as the Boat of Happiness. 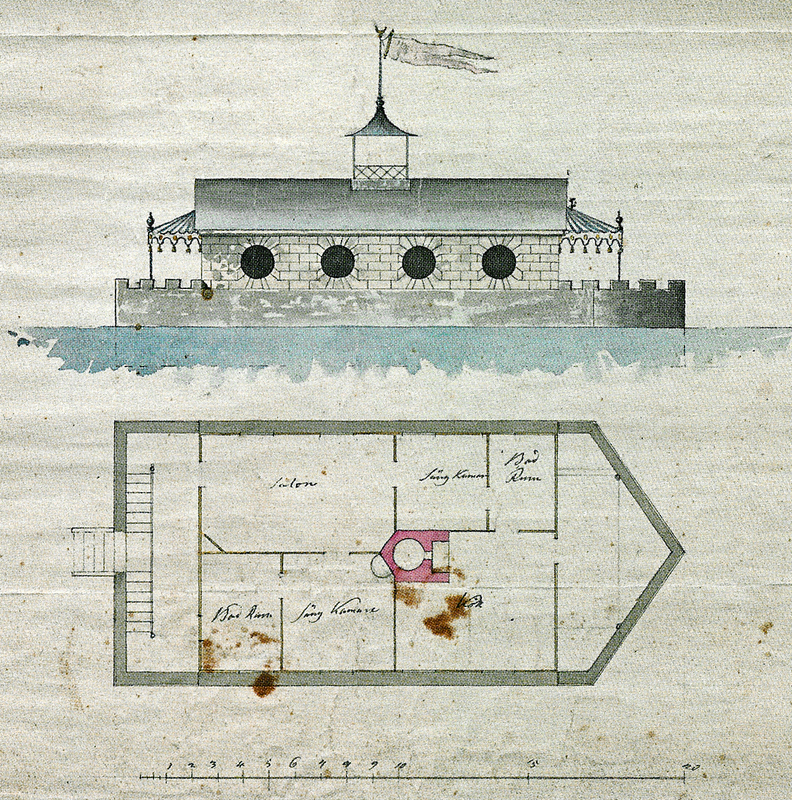 The boat folly tradition continued even after Gustav’s time and Noah’s Ark was drawn up in 1808. This huge boat was meant as a swimming pavilion and even had indoor rooms with fireplaces for warming up after a chilly swim. While a number of exotic follies housed practical functions, some of the non-palace buildings were more sober works of architecture. Gustav III’s guests were originally housed in pre-existing small outbuildings and cottages at the Haga Farm, known as Finnstugorna. The guests complained about the rather rustic lodging, and space was tight when Gustav invited large parties out to Haga. Guests made do with their simple lodging until a larger guesthouse complete with two kitchens, three dining rooms and numerous guest rooms was designed by Desprez and built in 1788. 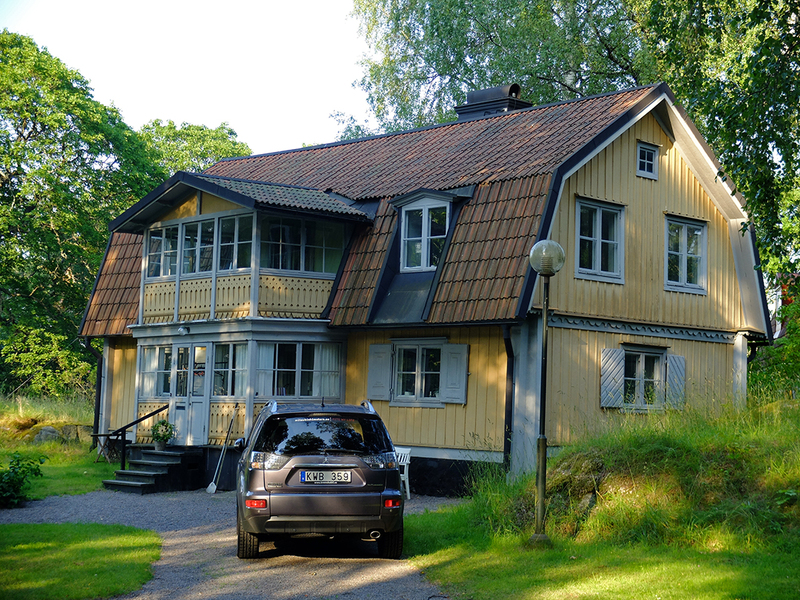 This guesthouse was known as Övre Haga or Upper Haga (Map 8). However, the guesthouse was converted into a large orangery and greenhouse just a few years later. (I am not exactly sure where guests were housed after the conversion, maybe at Gamla Haga?) Large kitchen gardens to support the palace were planted in conjunction with the greenhouses. The orangery (palm house) and gardens were opened to the public in the 1800’s, and they were eventually leased to Nordiska Kompaniet which tried to make a profitable business out of it. Today, the area is still used for commercial gardens and greenhouses as well as a greenhouse cafe and a rainforest butterfly exhibit which are apparently popular with winter-weary Stockholmers. Another more restrained work of architecture was Gjörwell’s stable which had space for nearly 200 horses. Construction began in 1789 but it was never finished. Gustavian is a well-defined and established style in Swedish architecture and interior design that roughly correlates to Neo-Classicism and the Adams style in other parts of the western world. The King’s tastes changed drastically over his lifetime, and his influence meant that the entire cannon of Swedish architecture changed with him. Before his trip to Italy, both Gustav and Sweden were firmly entrenched in a heavy rococo period with traces of left-over medieval and Dutch Renaissance styles thrown in. When he came back from his Grand Tour, Gustav threw Sweden into Neo-Classicism with its light, delicate decoration, pastel colors, simple forms, and direct references to Greek and Roman mythology and architecture. 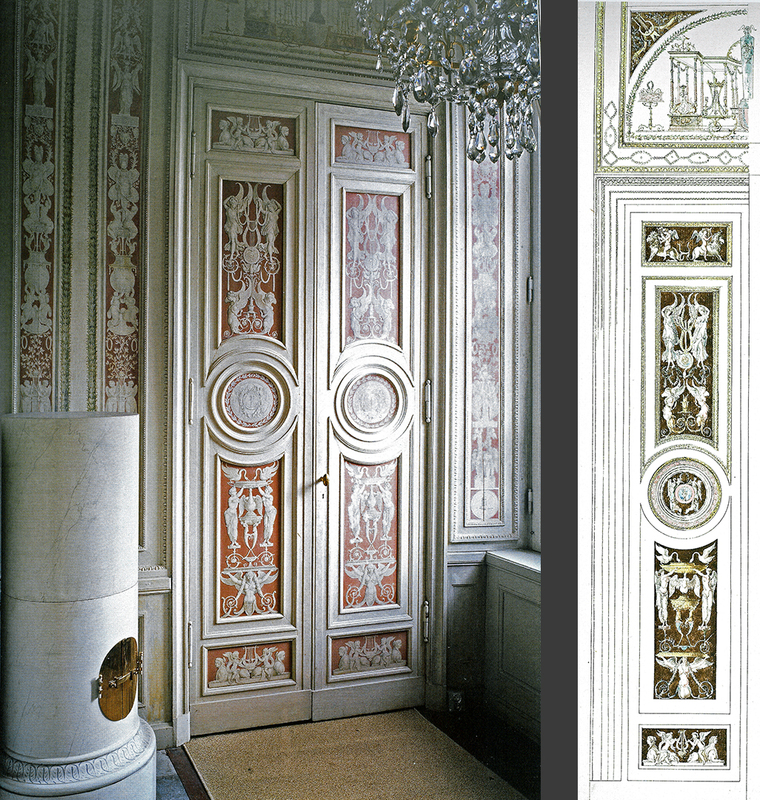 While there are other examples of Gustavian design in Sweden, nothing compares with the holistic ensemble of Gustav III’s Pavilion which incorporates everything from architecture and interior design to details like furniture design and upholstery, wall decoration, chandeliers, carpets, porcelain services, cutlery, glassware, linens, tile stoves, etc. Every little detail was custom designed to integrate with the whole, resulting in Sweden’s masterpiece of Gustavian design. The common theory is that the Pavilion was meant to serve as a temporary palace while the Grand Palace was under construction. However, this theory is most likely incorrect due to the meticulous design work and painstaking craftsmanship. Instead, it is most likely that the Pavilion was designed to be a private retreat from the large, semi-public palace. At the Pavilion, the King could keep company with a chosen few. 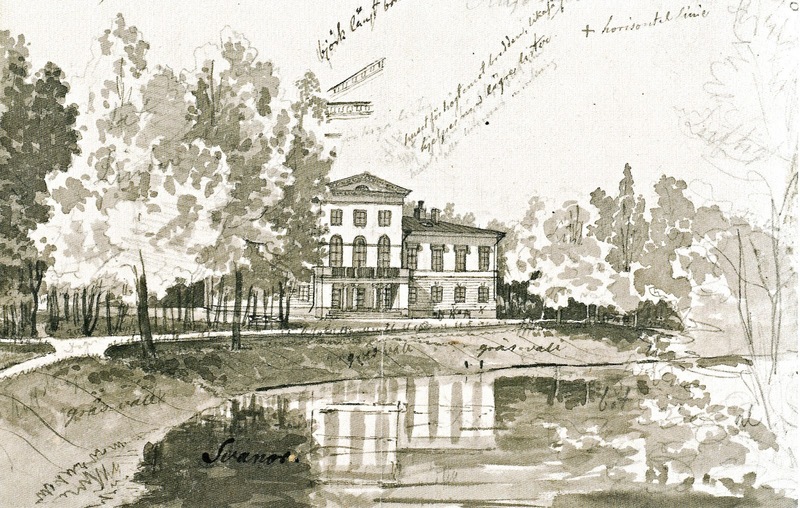 Gustav III decided to use the existing waterside Brahelund farmhouse as a starting point for the Pavilion. The farmhouse was originally a two-story square building with smoothly plastered walls. 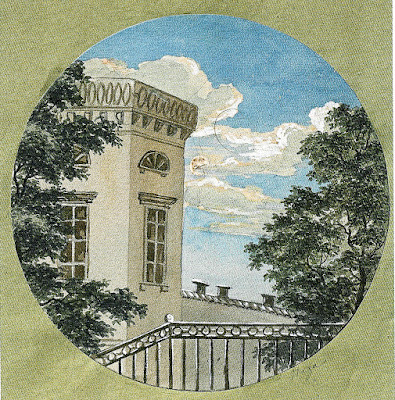 Although Tempelman was the Pavilion’s architect, his drawings (1787) are based entirely on drawings which the king had sent him. 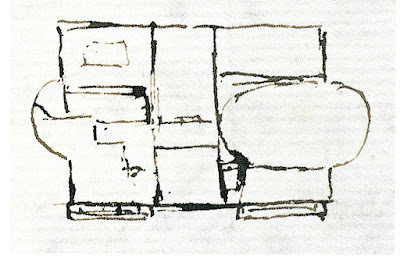 The King’s drawings show two wings which extend out from the original farmhouse which was heightened to three stories. 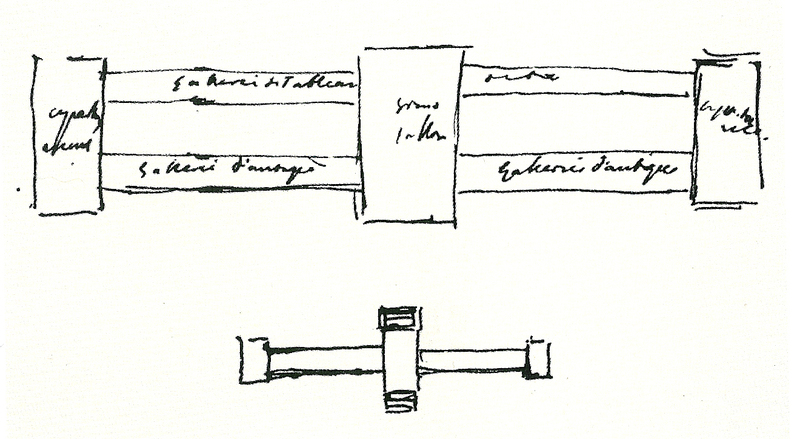 The King’s drawings have wings which are three bays each; the wings were extended to five bays during construction. An additional story was added to the farmhouse during construction. Another major change is that the dining room, labeled “Matsal” on the King’s drawing, stretches from facade to facade and has windows on both sides. The stair between the facade and the dining room was not built, and would have been quite strange as drawn because it would have poked up through the wing’s roof. Also, the entry facade changed from being a curved space to being a portico with frieze. The most significant development from the King’s drawings to the built Pavilion is the end facing the water which dissolved somewhere along the design, drawing, and construction process. It is not the solid wall shown in the King’s drawing; instead it is a gorgeous glass wall which brings the outside into the interior. 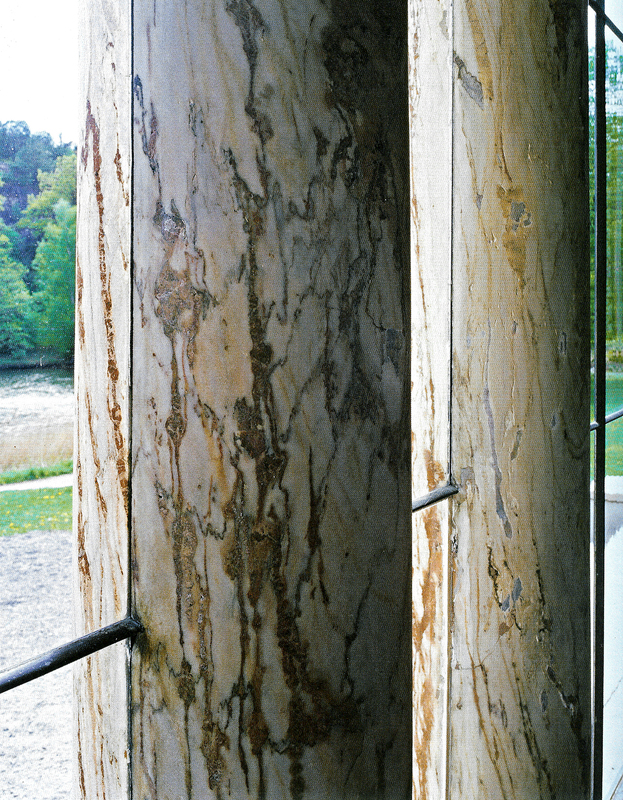 This kind of glass wall and dissolution between exterior and interior was unknown in Sweden at the time; actually, I am unaware of a similar contemporary example anywhere in the world. Extremely modern in both concept and in execution, the Pavilion’s glass wall seems to be 150 years before its time. Large mirrors along the hall reflect and multiply the light and the view; the resulting space is kinetic and magical in a way which is not captured in any photograph. The exterior of the Pavilion is relatively simple. The wings are lightly rusticated while the central bay is smoothly plastered. Large windows purposefully recall the windows at Stockholm Slott/Palace, bringing a hint of royal stateliness to the fairly small and simple building. Plaster friezes bring the interior’s Greek and Roman theme out to the facade. The nearly flat roofs are hidden behind simple, light balustrades. The resulting effect is rather Swedish: understated but elegant, luxurious but not ostentatious. The Pavilions front and back facades. French painter Louis Masreliez studied in Italy for twelve years before becoming a professor at the Academy of Art in Stockholm. 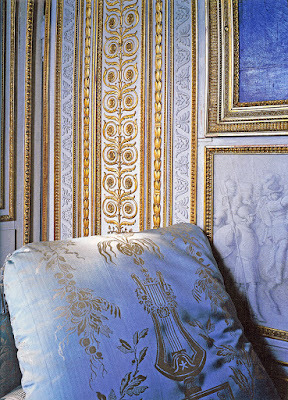 It is not for his paintings that Masreliez is well known, however, but for his interior design. 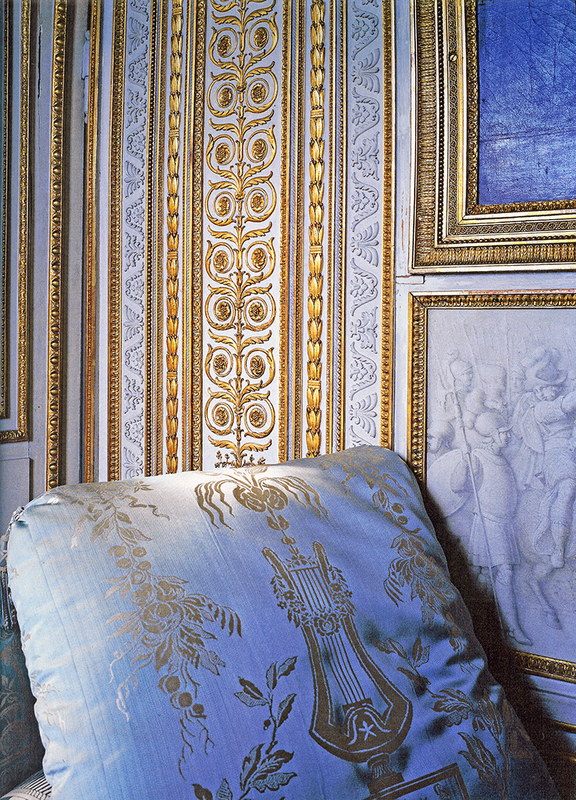 Masreliez drew just about every interior surface in Gustav III’s Pavilion. He lived in the Pavilion for two years and oversaw the daily execution of his designs. Masreliez also coordinated with furniture makers, textile weavers, and just about every trade so that the every detail of the Pavilion would strengthen the overall impression. 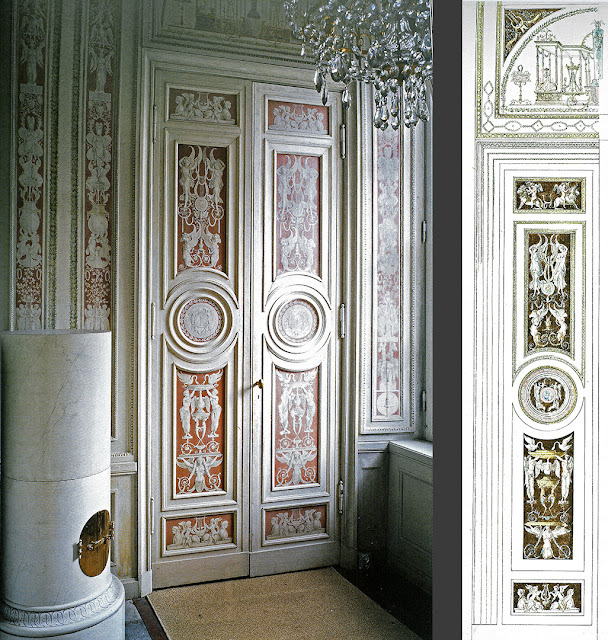 The interiors are heavily influenced by Greek and Roman patterns and mythology via the latest and trendiest French interpretations which Gustav brought home with him from his latest visit to Versailles. Urns, candelabras, egg and dart patterns, foliage, mythological figures and scenes, fruits, ribbons, musical instruments, and flowers interweave in delicate, symmetrical, often repeating ornamentation. Pastel colors, white plaster medallions, and delicate gold-painted trim provide an airy counterpoint to the rich silk textiles which upholster the furniture and at times the walls. 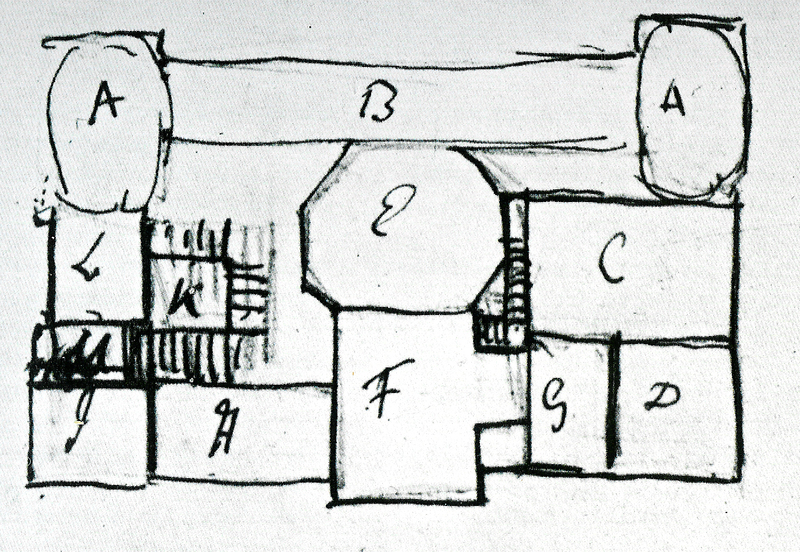 Gustav’s original plans for his palace were in fact not so grand. But after his second visit to Versailles and in conjunction with his political need to establish himself as an authoritarian, powerful monarch, the palace project progressively swelled to egomaniacal proportions. During the process, Gustav decided to combine the royal palace with a museum for his growing collection of antique sculptures. The ratio of palace to museum changed with time. 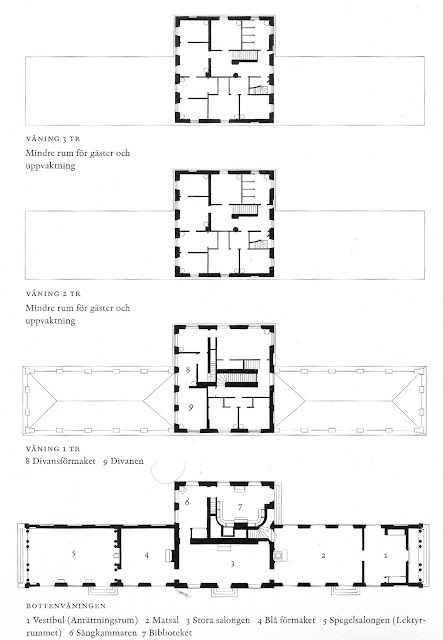 The following is a chronological account of the palace design, which can be seen in no less then sixteen different design phases. 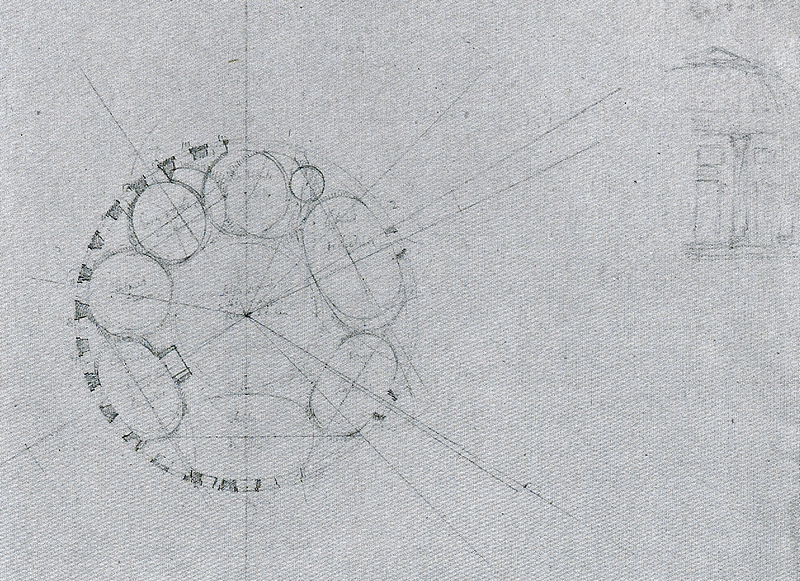 The first drawing we have of the Palace was drawn by the King, most likely in the early 1770’s. It shows the original Haga farmhouse expanded into a relatively modest villa. The villa is old-fashioned with its round towers and inspired by older Swedish Renaissance castles and palaces such as Gripsholm and Åkerö. 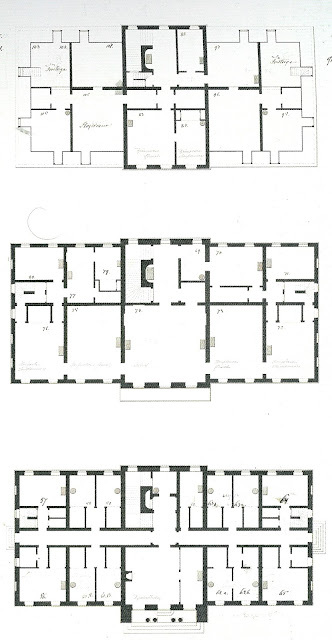 A few years later, in the late 1770’s, the King roughly sketched a floor plan with a prominent projecting oval salon. At the end of the 1770’s, the king brought in professional help. He enlisted Adelcrantz’s services to draw up a country estate for an antique-inspired monarch. 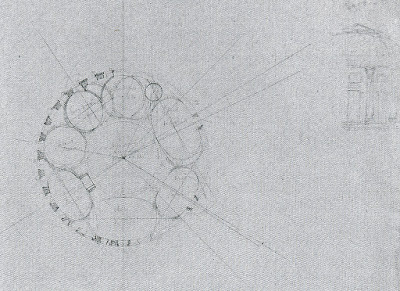 Here, Gustav’s ovular salon is centrally placed and perfectly rounded. Clerestory windows from the dome and cupula provided daylight into this central space which would otherwise have been windowless. Traditional royal suites for the King and Queen were placed on either side of the central salon. Adelcrantz’s drawings show a larger scale and more ostentatious facades than the King’s original drawings. These drawings are inspired by the ornate French Rococo style where more is always better. 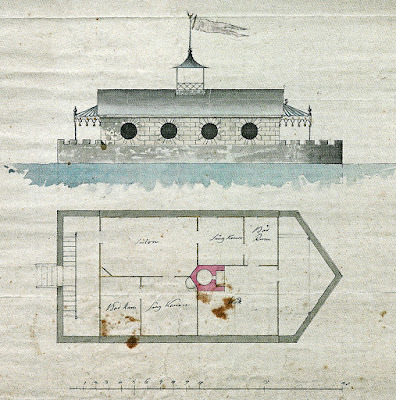 Sited by the water’s edge, Piper’s Casino from 1783 is much grander in scale than the King’s original drawings. 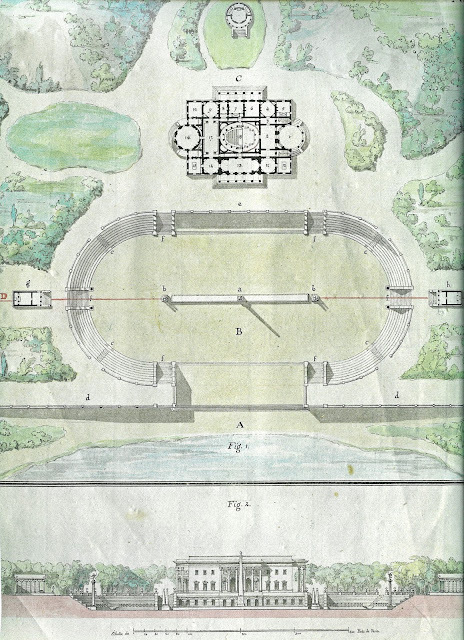 An obviously Palladio-inspired site plan includes a central main house connected by curving wings to two flanking pavilions. The buildings enclose a large terrace which is reached from the water by a wide, stately staircase. Piper’s plan includes not one but two projecting oval salons which were to be a dining hall and a library. Large rounded porticoes project over the ovular salons while rectangular porticoes face the visitor when arriving by water or by land. The King thought this proposal a bit too frilly, preferring something with simpler, more elegant facades. The King bought his antique sculpture collection in 1784, and he needed somewhere to house it. At first he planned to build a museum gallery at Drottningholm Palace, but he soon changed his mind and decided to house it in his palace at Haga instead. This marks a major shift in the purpose of the Grand Palace at Haga. First envisioned as a restrained and private country escape, the palace was now to be grandiose and representative of the powerful monarch and nation. It would no longer be a private retreat but would be the site of grand dinners, glamourous parties, and even a semi-public sculpture museum. In 1784 Léon Dufourny expanded upon Piper’s proposal. The waterside terrace, curved wings and flanking pavilions were replaced by a gigantic Roman-inspired racetrack with seating for 10,000 spectators. Obelisks punctuated the center of the racetrack. 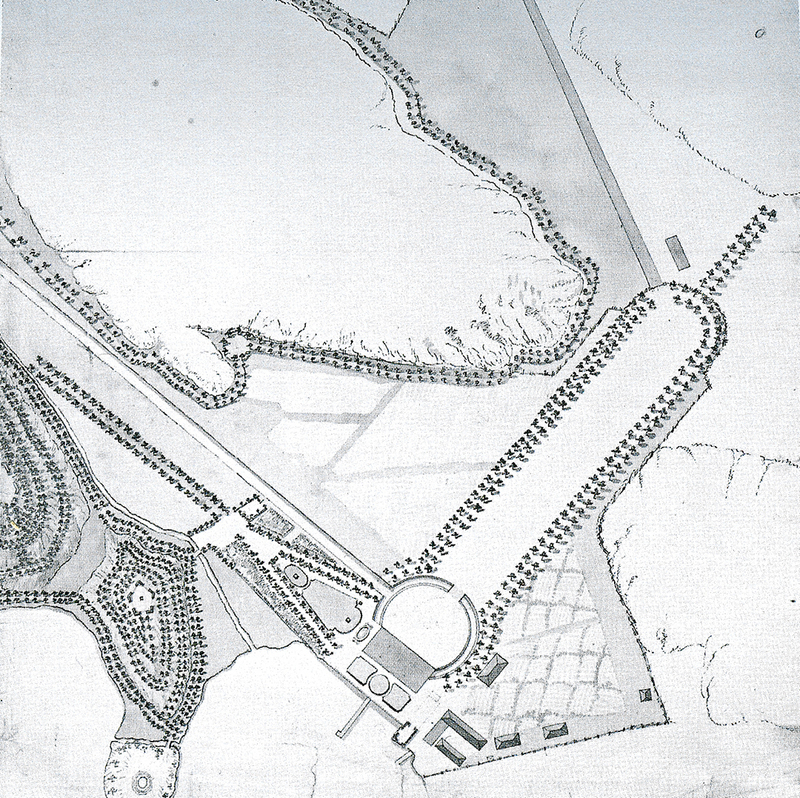 Two pavilions on either side of the racetrack would house the King’s sculpture collection. 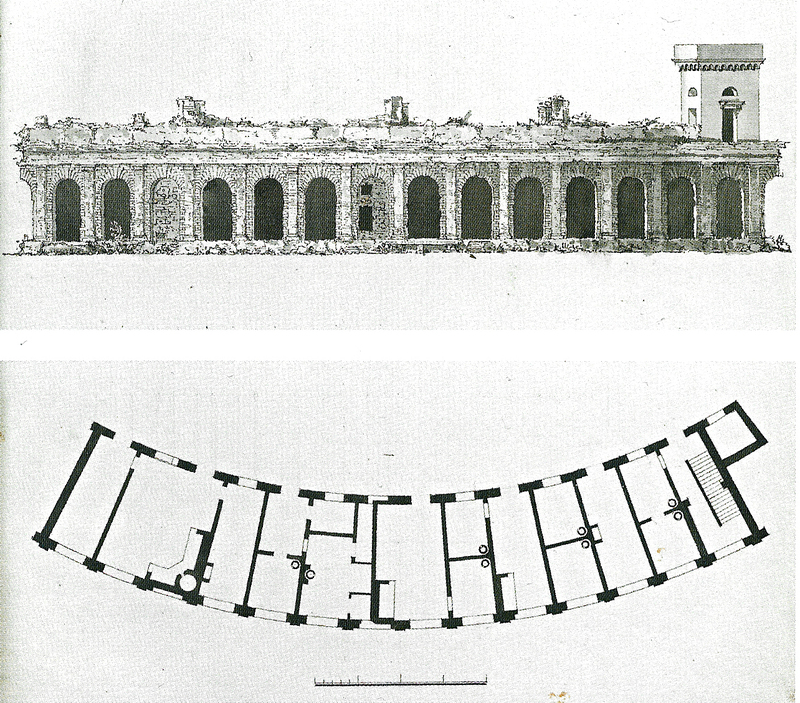 The Palace’s two projecting ovular salons became circular, and an ovular theater was inserted into the middle of the building. 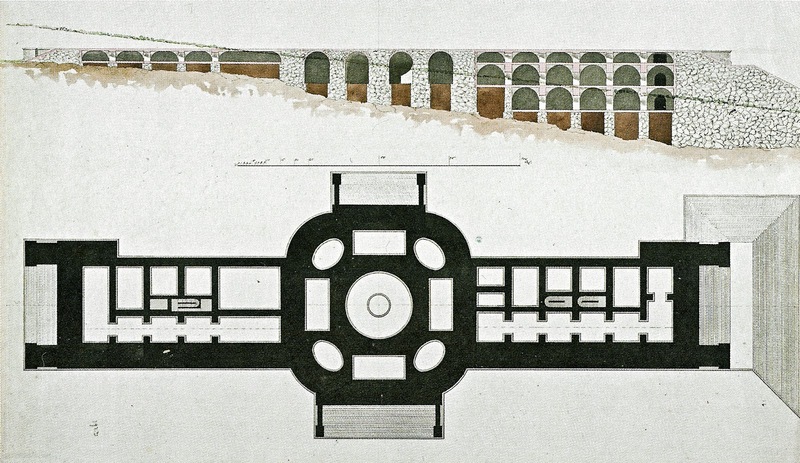 Another sketch in the King’s hand from 1784 reined in Piper and Dufourny’s grandiose plans. 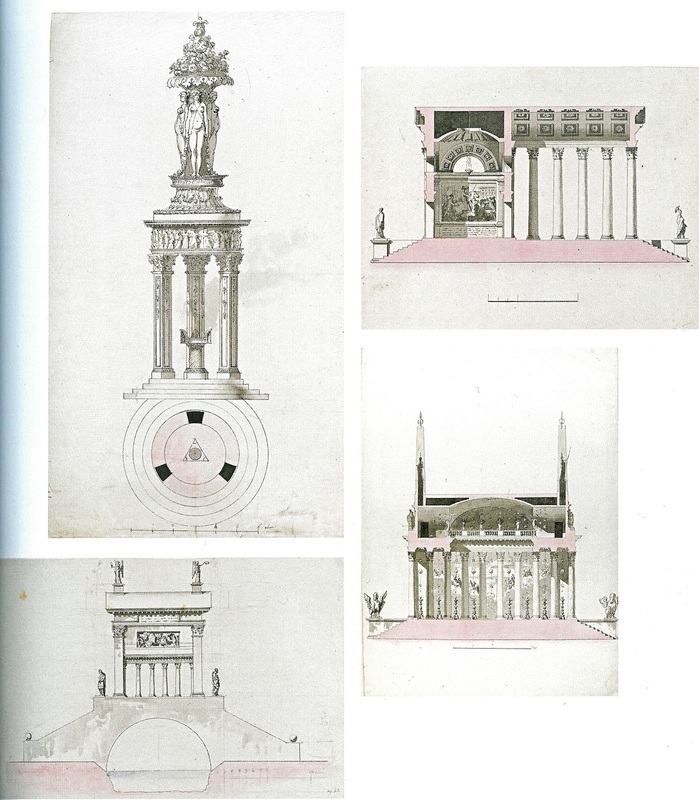 The round temple-like form with crowning cupola was directly inspired by le Désert de Retz outside of Paris. 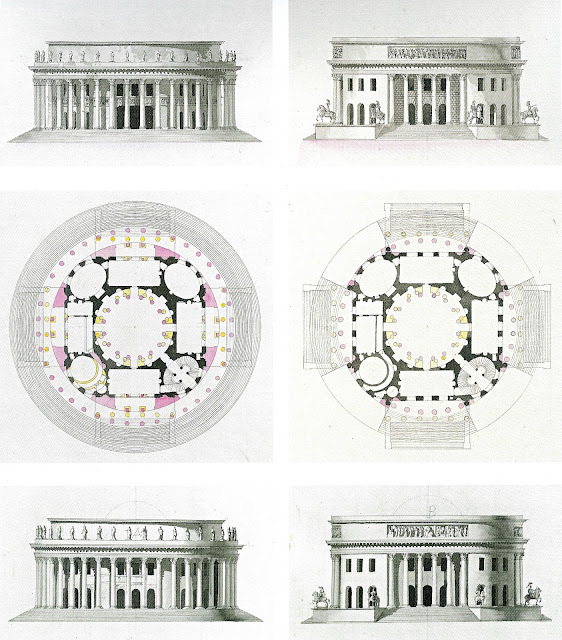 The King even ordered drawings of Retz’s colossal Palladian columns. Interior rooms were all circular and ovular. 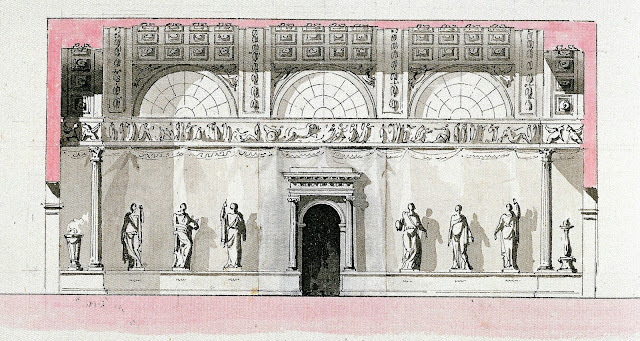 The King’s museum intentions began to grow again with this sketch from 1784. The long gallery marked “B” and the flanking rooms marked “A” were meant to house his collection of sculptures. Dufourney proposed to separate the museum and theater from the palace and drew a Neo-Classical proposal. The King rejected this idea. The King and architect Palmstedt worked closely together on these designs with a central octagonal salon and ovular rooms at the corners. 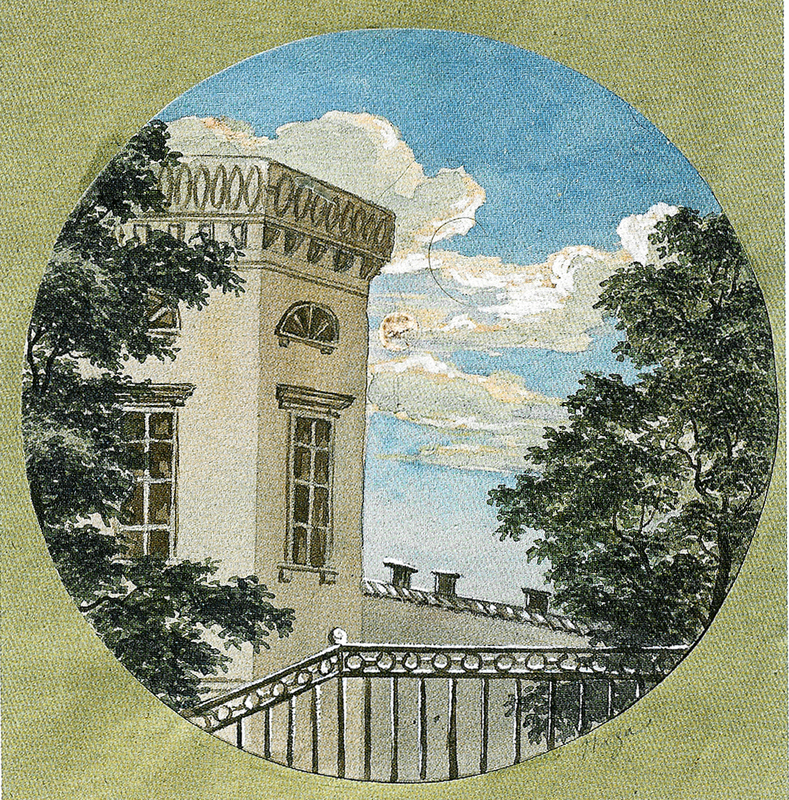 After the King bought the adjacent farm of Brahelund in 1785, the palace moved from the water’s edge at Haga farm to the top of a hill at Brahelund. Wanting to break from all Rococo-inspiration and to turn instead to a simple, elegant Neo-Classicism, Gustav turned to architect Olof Tempelman who had studied architecture in Italy at the King’s expense. Tempelman’s drawings from 1785 are directly inspired by the King’s sketch of a round, temple-like palace, Palmstedt’s rounded corners, and Palladio’s Villa Rotunda in Vicenza. Completely symmetrical with four porticoes and a low rotunda, the palace had rounded corners and a central, round salon. This form was more suited for an intellectual salon than for a royal residence in the traditional sense with suites of rooms. The idea of a museum seems to have been left out of Tempelman’s proposal. Construction work on the palace began in 1786, and the cornerstone was laid on the anniversary of the King’s first coup fourteen years before. 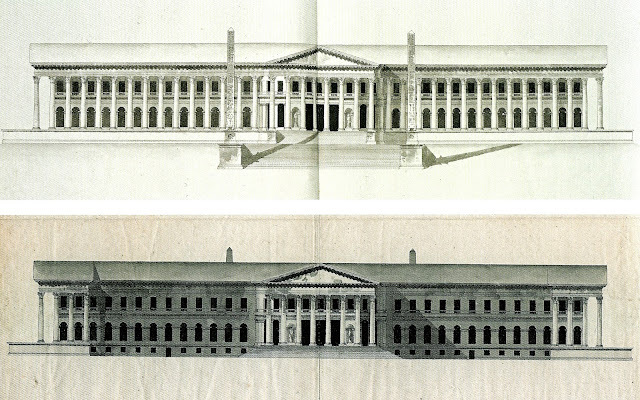 The construction work was at first based upon Tempelman’s drawings from 1785. The King brought in Desprez in 1786 to simplify Tempelman’s drawings while keeping the basic Villa Rotunda concept. Desprez’s design emphasizes the contrast between flat surfaces and heavily decorated elements. The King wasn’t satisfied with Desprez’s drawings, so Desprez completed four more variations on the theme in 1787-88. The palace became more and more temple-like as it became more and more rounded. In 1788, politics became even more complicated for Gustav as the nobility continued to tie his hands. The monarchy’s absolute power was in question once again, and the nobility began to gain the upper hand. Accordingly, the Grand Palace at Haga began to grow again, asserting the King’s dominance and power through a monumental form. The king moved away from a compact, temple form and sketched an elongated palace which can only be based on the Vatican Museums. The long arms are gallery spaces for sculpture and painting collections. The royal apartments were in one of the side pavilions. In this sketch, the museum component of the palace is much grander than the palace itself. 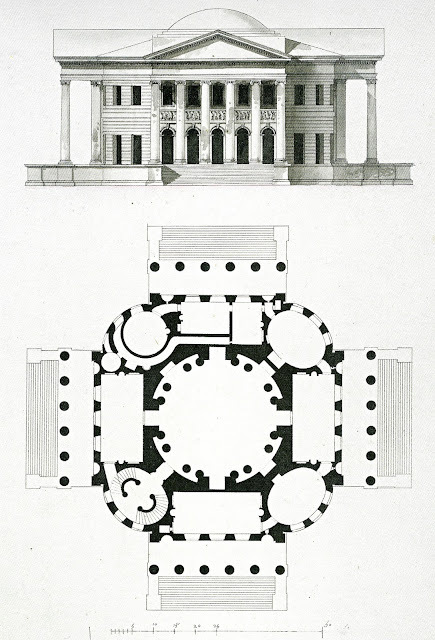 Desprez expanded upon the King’s sketch and the Villa Rotunda form in 1788 by stretching two of Villa Rotunda’s facades outward. A central dome and cupola let light into the central round space. Almost the entire facade was colonnaded. In Desprez’s drawings, about half of the building would be used as royal apartments while the other half would be museum spaces. The museum galleries were full height (three stories) with two side aisles, much like a church. Wall surfaces in the galleries were mostly unornamented in order to emphasize the art. The galleries were in the middle of the palace and thus had no windows, but the roof above the side aisles was to be glass so that light could filter in from the attic and into the gallery spaces. This lighting scheme, coupled with supplemental candelabras, would have been incredibly dramatic. Further developing the elongated palace form, Desprez moved away from the Villa Rotunda’s dome. 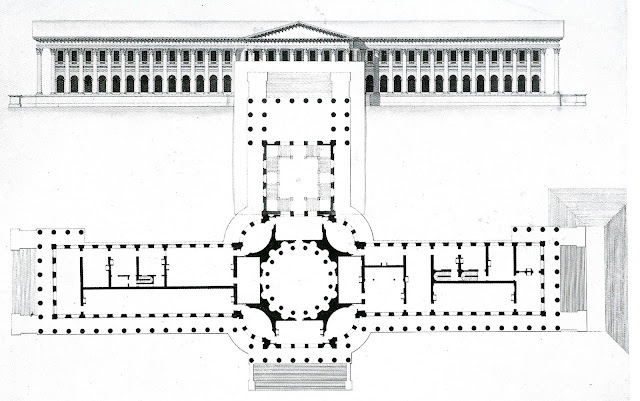 In this proposal from 1790, right after the King’s second coup, the palace wings are even longer and the colonnade is more monumental. The central “temple” tympanum projects from the palace wings and is framed by two colossal obelisks. 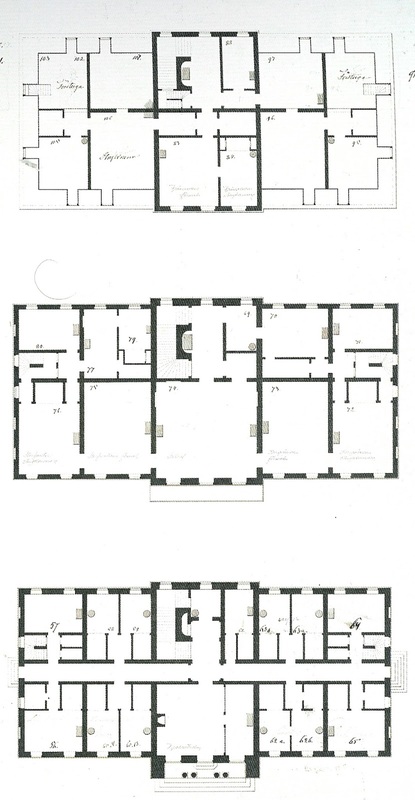 The museum function is diminished and the royal apartments and staterooms have once again become more prominent in the floor plan. The monumentality of this proposal is hard to read in drawing form, but if completed, this palace would have easily been Sweden’s longest. With its setting high on the crown of a hill, this palace would not have failed to impress from the water or from the land approach. This palace would have been the incarnate form of an absolute monarchy. 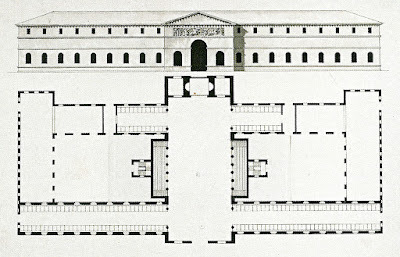 By the time the King was assassinated in 1792, the foundation and basement level of this proposal had been built, largely by 150 Russian prisoners of war. A foldable addition to Desprez’s 1790 plan drawing created an even more monumental entry sequence. The entry portico projects disproportionately far—the exterior portion of the portico has grown and a monumental interior stair hall has been inserted between the portico and the interior. This is a decidedly clumsy addition to a scheme which had been harmonious. The interior of the monumental stair hall was to be Egyptian themed, symbolizing the King’s pharaoh-like status as God-ordained omnipotent ruler of his kingdom. An immense, rounded forecourt was also added to the scheme. I do not believe that this site drawing is based on any sort of reality since the palace was sited on top of a fairly steep hill. This size of a forecourt would therefore have either required Inca-scaled earthworks or it would have sloped significantly downward, diminishing its impressiveness. 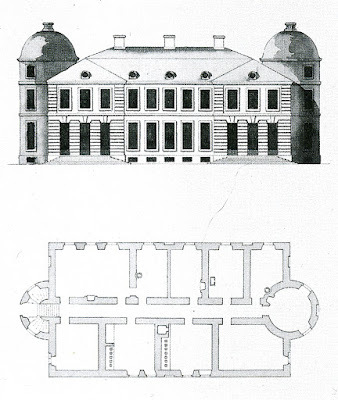 It seems that at this point in time, Desprez was more-or-less stoking Gustav III’s already large ego through unrealistic and extreme architectural drawings. Naturally, work on this monument to absolute monarchy halted immediately after Gustav III’s assassination in 1792. The foundation and basement were left as is, and despite a lot of forest growth, they are still visible from satellite photos. Today, the palace is a bit hidden in the undergrowth, and only an unofficial-looking path leads to it. 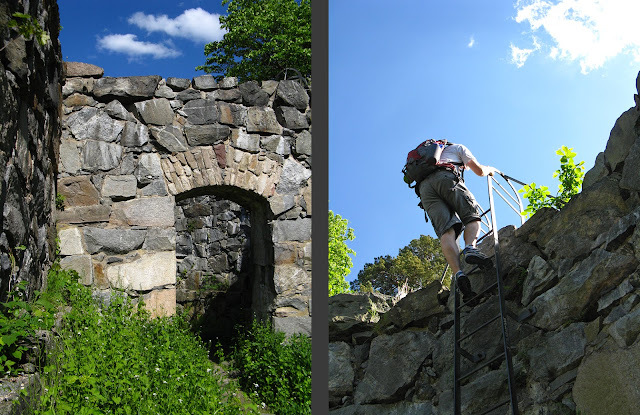 After stumbling upon the ruin, visitors can climb on and through the structure (although the ladder was a bit wobbly...). The brick for the remaining three stories had already been manufactured, so it was moved to nearby Karlberg Slott for its expansion into a military academy. 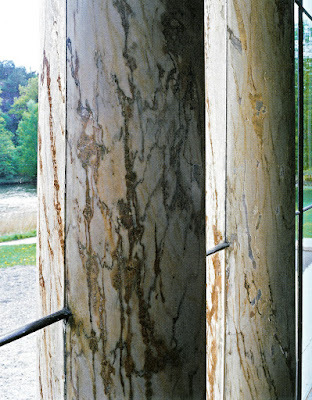 Other materials were incorporated into various building projects over the next century, including the marble which was used in the Nordiska Museet. 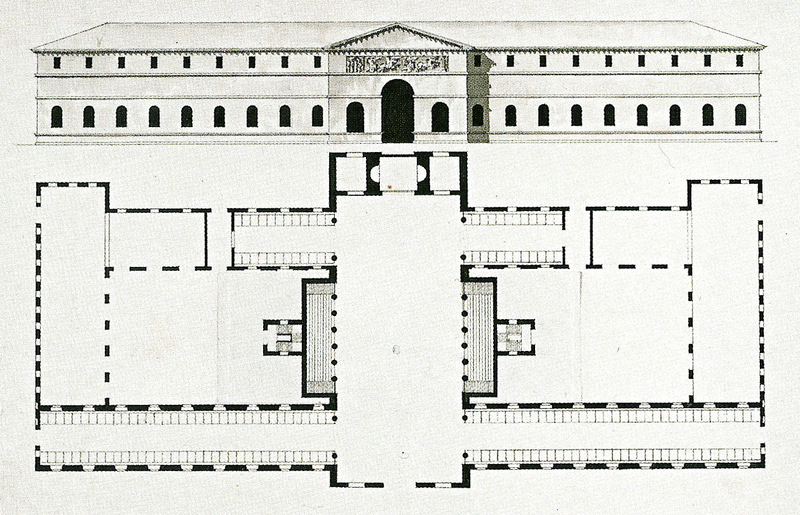 Shortly after the King’s death, Karl XIII opened a public art museum in the basement of Stockholm Palace as a national monument to the memory of King Gustav III. 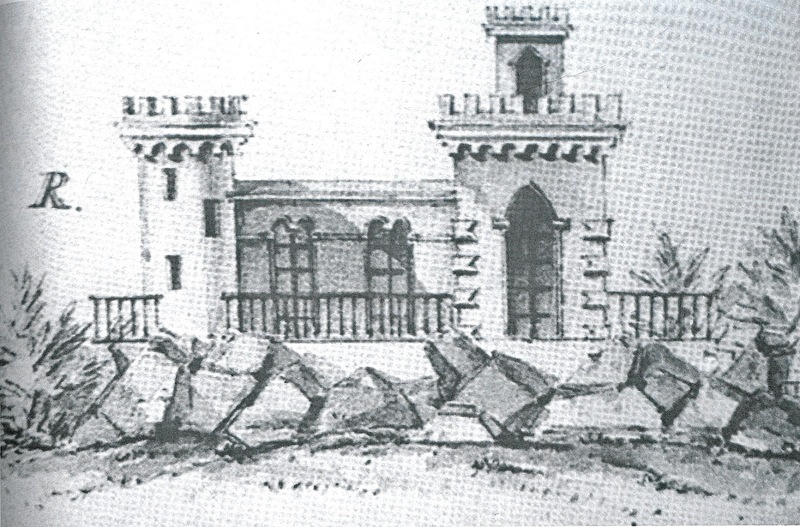 Confusingly, yet another palace was eventually built at Haga Park. King Gustav IV Adolf and his family frequently used Gustav III’s Pavilion, but this intimate retreat was too small for a large royal family and all of their servants. In 1802, Gustav IV Adolf decided to build a new palace on the grounds to house his three children. The adults would still live at the Pavilion while the children would live at the new Haga Palace. 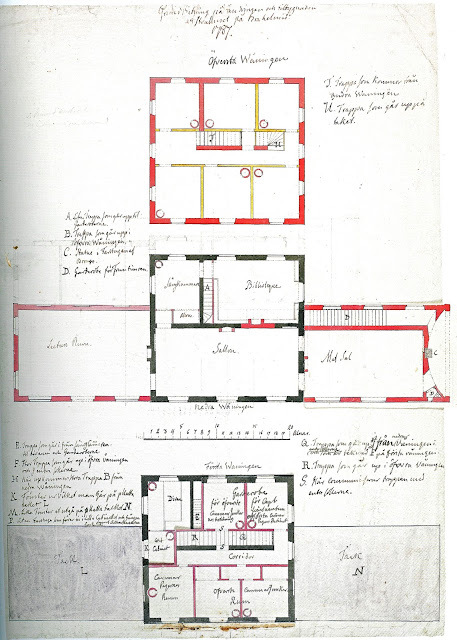 Architect Carl Christoffer Gjörwell had been a student and assistant to Desprez during the various stages of the Grand Palace project, and he was deemed suitable to design a modest palace. Unlike the Grand Palace, Haga Palace was sited close to and directly facing the water. The exterior directly references Gustav III’s Pavilion with a taller central pavilion, lower wings projecting from the center, arched windows, a rusticated base, and smooth plaster on the upper stories. The roofs, however, are more prominent at Haga Palace. 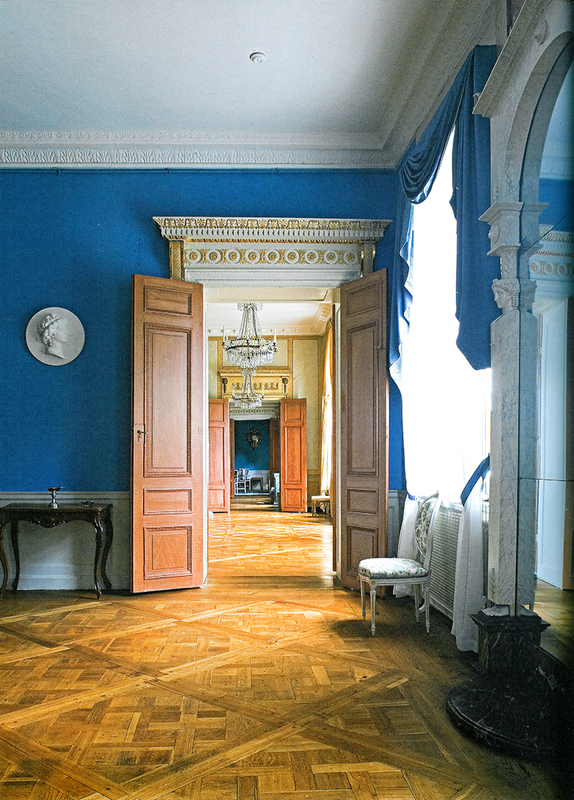 Haga Palace’s interiors are decidedly simpler than in Gustav III’s Pavilion. Because this palace was not meant for public functions, it did not need to be as ornate or polished. Succeeding generations of royal families have regularly used Haga Palace as their home base. The current King was born and grew up in Haga Palace, and the current Crown Princess lives in the Palace with her family. This is the only royal palace that is not open to the public today. In fact, unlike the King’s residence and grounds which are open to visitors (the grounds are even open as a public park all night), Haga Palace is completely enclosed by a fence and the public can barely even catch a glimpse of the building, much less enter it. The park had been semi-open to the public even during Gustav III’s time—an entrance fee kept out the riff raff and the public was allowed only when the king was not in residence. In the 1800’s, the park was fully opened to the public and it has been well used and cherished by Stockholmers ever since for picnics in the summer, sledding in the winter, weekend promenades, and holiday celebrations. In the 1800’s, several kiosks and restaurants were built in the park, but only one remains today. 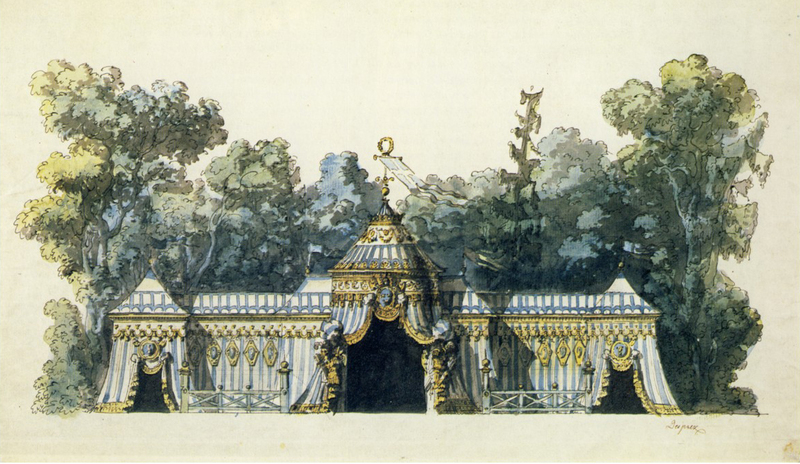 After Gustav III’s assassination, the palace Pavilion continued to be frequently used and tended by succeeding kings, but the follies were left to deteriorate. A large renovation effort in the 1930’s saved many, but not all, of the follies from rotting into oblivion. The most significant change to the park was the lowering of the water in Brunnsviken in 1863. At one point in time, Brunnsviken was navigable from the Baltic, but the continuous rising of the land meant that the bay had become completely closed off from the sea and that the water in the bay was polluted and stagnant. In 1863, a canal between Brunnsviken and the Baltic was blasted and the water level in the bay sunk four or five feet. This drastically changed the park’s waterline which receded far from its original location. Gustav III’s Pavilion’s and Haga Palace’s close relationship with the water was lost. Additionally, the archipelago of small islands with their scenic canals disappeared. The water in Brunnsviken is now clean and swimmable, but it is a pity that such important aspects of the park were lost forever. 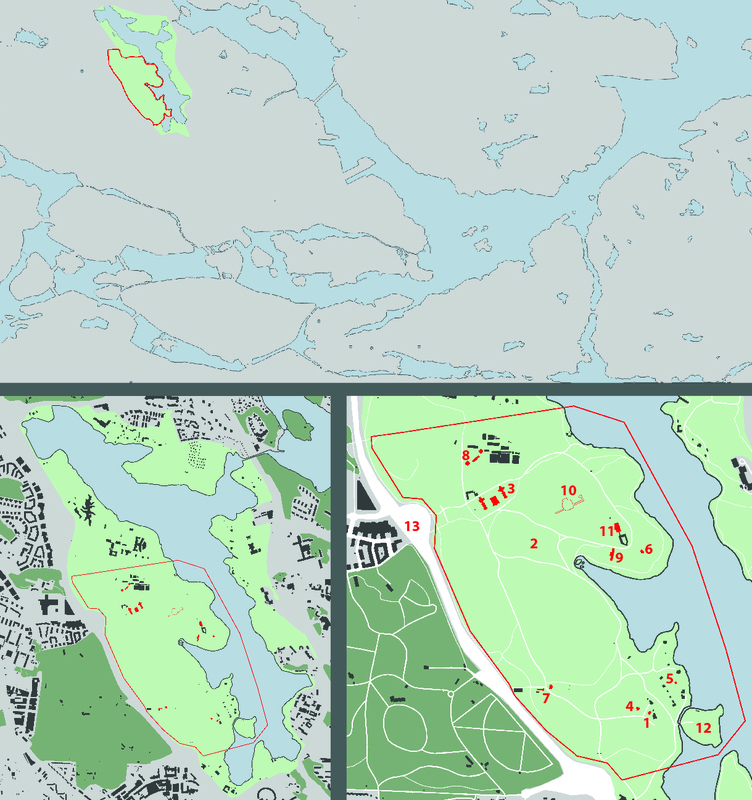 Stockholm and Solna gradually began to encroach on Haga Park in the 20th century. The main road to Uppsala was expanded into an eight lane expressway (I know that doesn’t sound so big by Atlanta or Los Angeles standards, but this is probably the biggest and busiest stretch of expressway in the entire country of Sweden), further encroaching on the park and creating a significant barrier between the park and the city (Map 13). New developments were allowed to be built on park land. After a twenty-year long process of protest, discussion, and compromise, Haga was incorporated into the world’s first National City Park. The park is now officially protected as a green oasis. This highway borders the park, and this office building was built on park land. Today, Haga Park is considered to be Europe’s largest and best preserved romantic English garden. It is truly an inviting and beautiful landscape for meandering walks, summer picnics, and winter tobogganing. Being just steps outside of central Stockholm, it provides an important counterpoint to the dense “stone city.” The park is beloved by Stockholmers and few fail to enjoy the park at least a few times a year. While much of the park is groomed and cultivated, there are surprising stretches of deep forest which are crossed by small, informal and unmarked trails. The juxtaposition between the groomed Great Lawn and these patches of forest is wonderful. It is hard to believe that such primal, deep forest is so close to the capitol city. The park is in the process of being physically connected to downtown as the E20 highway is currently being decked over, and a huge new city development called Hagastaden, or Haga City, is being built over the highway. Soon, the walk from downtown Stockholm to Haga Park will not be as jarring and tiresome as it was/is. Instead of crossing a vast highway, the walk will now go through a new urban area. As a Solna resident, I am quite jealous of Stockholm’s new link to the park and I wish that Solna would build a similar project over the E4 highway from the Solna side. Like most Stockholmers, I am much enamored of Haga Park, especially the areas developed by King Gustav III and covered in this post. However, the remaining areas of the park feel underutilized and half-forgotten. I will be exploring the background of these areas in a future blog post. Thank you so much for such a detailed observation and information on the mud maps and sketches. Really great for a project I am working on at the moment .